Want to see more videos like this and see a live demo "membership site" that's built with Memberium where you can see how the Umbrella Accounts add-on works? Have you ever wanted to offer your membership program to small businesses, teams, groups or corporations? If you have, we’re excited to officially release the “Umbrella Accounts” feature that allows you to do just that. The feature is referred to here as “Umbrella Accounts”, but you may have also heard it referred to in the past as "Sub-Accounts", “Parent/Child” add-on, “Group Accounts”, “Team Accounts” or “Corporate Accounts”. This new feature is only available for all Memberium “Pro” or Memberium “Advanced” licensed users. If you’re a Standard license user that’s interested in using this new feature, you can contact support for help with upgrading your account. In a nutshell, this new feature enables your member to give access to any team or group of people. This allows a single customer to control who gets access to the membership program under them and manage the accounts they create under them. 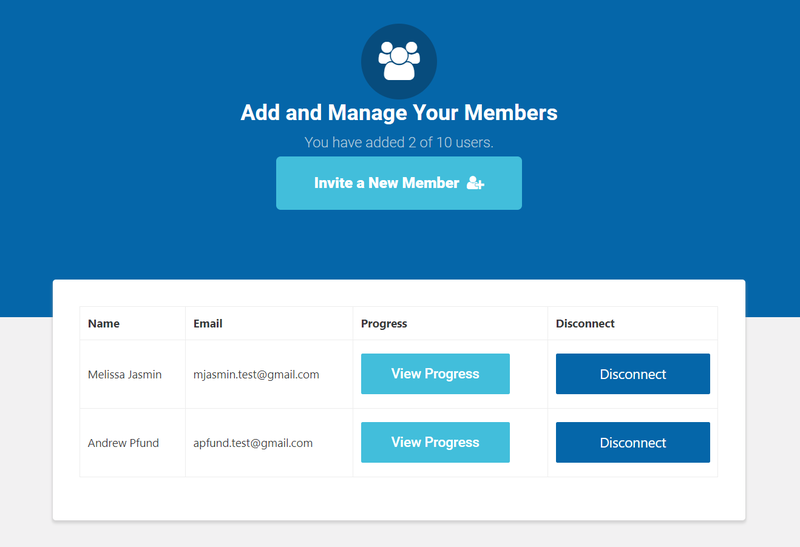 The number of members that they can add can be controlled by their product subscription, tags, or their individual settings. If you’re an existing Memberium “Pro” or “Advanced license holder, you should see the 'Umbrella Accounts' settings automatically show up in your WordPress Admin area under the Memberium menu as pictured above. To learn more about all the specific settings that come with Umbrella Accounts, you can check out the existing documentation here. 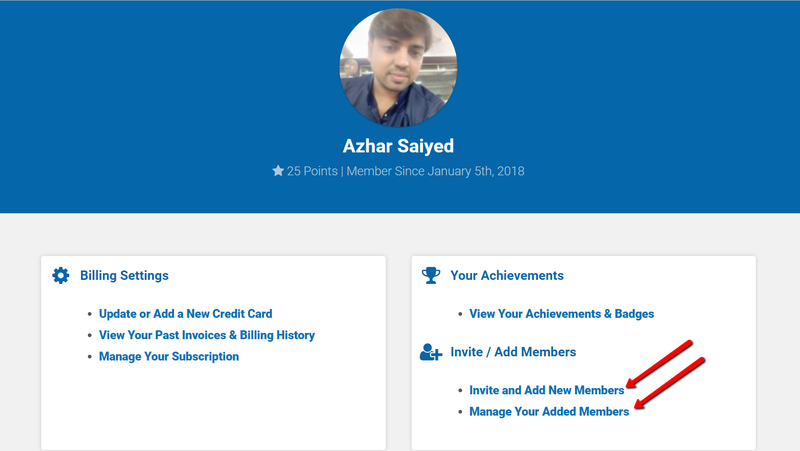 Under the ‘Subscriptions’ tab pictured above, you’ll be able to define how many ‘sub-members’ a new customer can invite to the membership program based on what subscription they had purchased to offer tiered memberships. We'll cover this part more towards the end of this article. After the Umbrella-related settings are configured, here’s how it works for a customer after they join as a member. Immediately after purchasing, they’ll be sent their login info they can use to log in to the membership site. Once they’re logged in, they can then access a control panel where they can enroll and disconnect sub-members they'd like to invite to the training program. This My Account page is one of our 24 pre-built templates and available for all new or existing Memberium customers. You can setup your My Account and other umbrella accounts pages quickly using our templates. To enroll new sub-members and invite them, all the team leader needs to do is fill out a simple web form with the name and email address of the other sub-member they’d like to invite and click 'Add Account'. This web form uses the [umbrella_enroll_child] shortcode that would placed on a page that only the team leader can access. Once a sub-team member is enrolled, they’ll then be sent their own unique log-in information and email follow up reminding them to complete the training (assuming everything is setup correctly in Infusionsoft). When a new sub-member is added, they'll get their own WordPress login, so plugins like LearnDash will recognize each sub-member’s account as a separate and individual user. 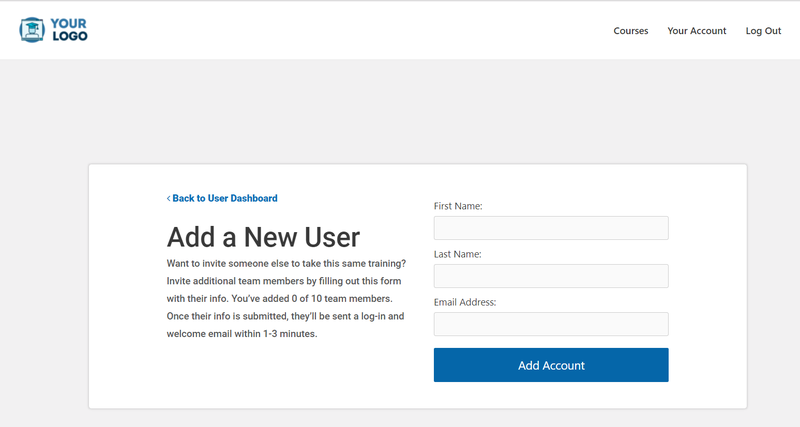 To add additional sub-team members to take the training, all the team leader would need to do is just fill out the same web form again with the new team members info. Here is how the 'Add a New User' form looks like. You can also customize the form and add additional fields, depending on what you want the parent users to add, like a phone number, address, Infusionsoft custom fields and more. This template is included in our 24 pre-built templates set that are available for all new or existing Memberium customers and help make it easier to setup Umbrella accounts for your membership site. Whenever a new sub-member is successfully added through the web form, they are automatically added as an Infusionsoft contact with the contact info entered. An Infusionsoft action set runs that would appropriately tag them so they can access the membership site, plus any other tags that you want to be applied, and they can then be added to any Infusionsoft campaign or receive any type of follow up via Infusionsoft going forward. If at any point the team leader wants to remove one of the sub-members access, all they need to do is click the “Disconnect” button pictured to the right, and that specific sub-member's access is removed immediately via an action set that removes the tags that would give them access to the membership site. To remove a sub-member, clicking the "Disconnect" button will run an Infusionsoft action set that removes their access to the membership site. You can now allow parent members to be able to view their added member's LearnDash course progress. Here's an example of what this would look like when set up properly. 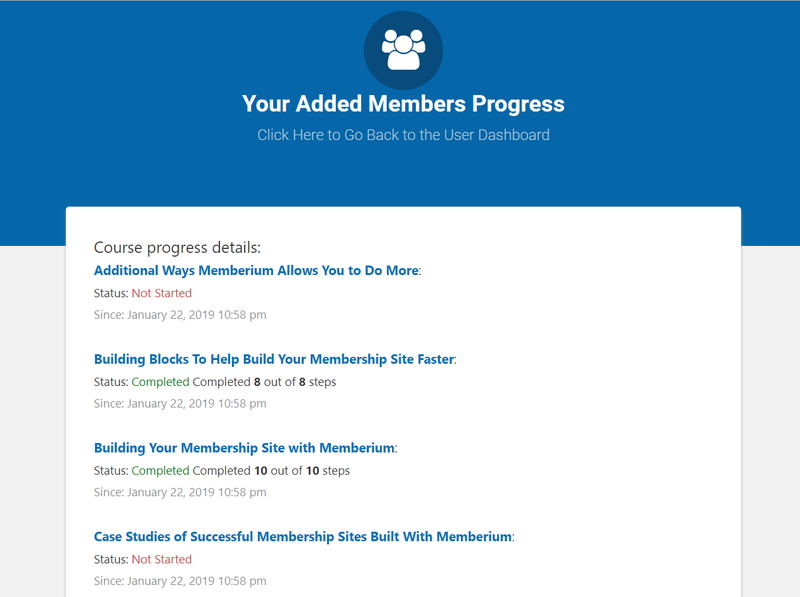 You can allow the user management page to display a button to view that added members progress. When the "View Progress" button is clicked it's sent to a page with [umbrella_ld_course_info] placed on it and that's what will list the child user's progress. One of the best parts about Umbrella Accounts is you can easily set up multiple tiered memberships that allow a single member to add a certain number of sub-members, based on the Infusionsoft subscription they had purchased. Here's an example of how tiered subscriptions work with Memberium Umbrella Accounts. Anyone who joins the Bronze Membership, for $47/month, will be able to add up to 5 sub-members under their account. Anyone who joins the Silver Membership, for $97/month, will be able to add up to 10 sub-members under their account. Anyone who joins the Gold Membership, for $177/month, will be able to add up to 25 sub-members under their account. Any subscriptions that you’ve created in Infusionsoft will show up on this list once synced, which makes it easy to setup these types of multiple tiered memberships. After getting this far, do you think your membership program could be used by any specific groups of people, teams or corporations with umbrella accounts? A great example of how these memberships can be positioned comes from Digital Marketer’s HQ program (pictured below). To be crystal clear here, Digital Marketer does not use this Umbrella extension for their HQ program. 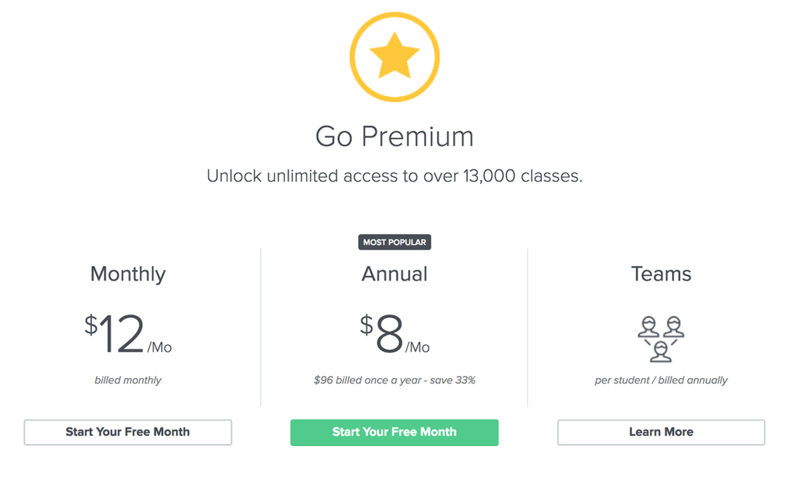 But is still a great example of how these types of tiered memberships can be positioned. Here's another pricing example from SkillShare. 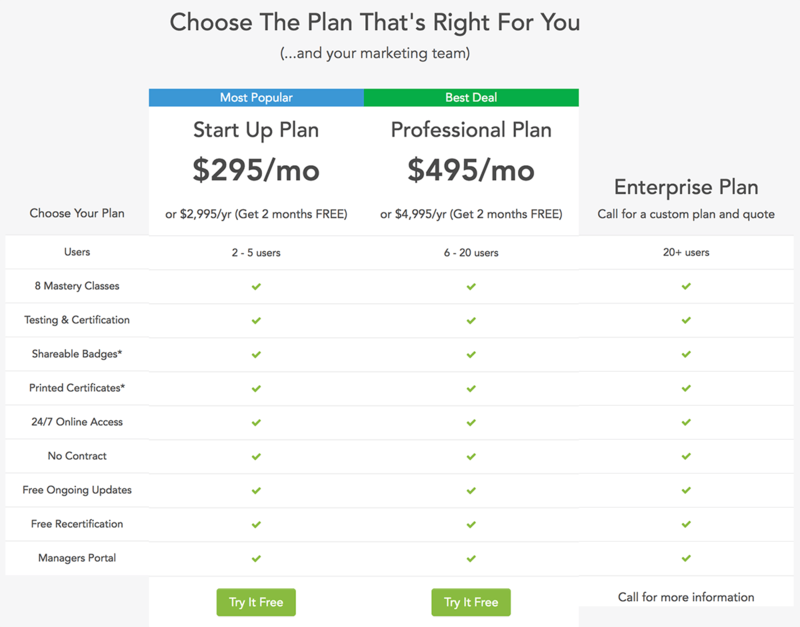 Their "Team" plans are positioned side by side with their individual plans and are priced by individual user. Corporate accounts often want to enroll large groups of people from their company into a training program, but will want the billing and account management to be handled by one key individual so employees don’t have to use their personal credit card or have control of the account. Umbrella accounts help make this a breeze. Does this help give you any ideas you could potentially implement for your membership site or course? 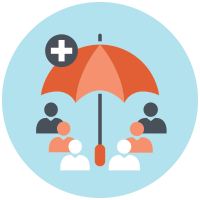 Ready to Start Using Umbrella Accounts with Your Membership Site? This feature is available only for Memberium “Pro” or Memberium “Advanced” license holders. If you’re a Standard license user that’s interested in using this new feature, you can contact support, and they can help upgrade your account. We hope that you’ll be able to take advantage of this new feature for your membership site. If you have any other questions about how it works or how you could potentially use it feel free to contact support.